The easiest recipe to make ever. 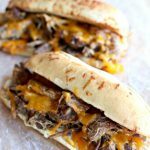 With only 5 ingredients total (beef, broth, onion soup mix, cheddar and sandwich buns) you may be thinking that this recipe is just too easy to taste good. Well, you’re wrong 🙂 The flavor is amazing and your family will be asking for seconds. Cut the roast in half and place in the Instant Pot. Sprinkle the onion soup on top. Pour in the broth. Cover the Instant Pot and secure the lid. Make sure valve is set to sealing. Set the manual pressure cook button to 60 minutes. Allow the pressure to release naturally for up to 20 minutes and then move the valve to venting to remove any remaining pressure. This natural release is what’s going to make the beef so tender. Remove the lid and place beef on a cutting board. Shred. Return shredded meat to juices in the pot.